I enjoy baking and grilling whole fish. My kids love seeing the fish and I love the way it looks. I find buying whole fish allows the fish to stay a bit fresher. I have the fish descaled and gutted before I leave the seafood store. I try to buy fish that has been caught that day. I would love to catch our own fish but the fish tale has yet to be written. We have all the gear. We live near the water. We buy the licenses each year. We never catch any fish. My husband is convinced it is because we don't own a sea kayak or a boat. I am not sure I agree with this because I see family's all along the water edges fishing and catching real fish. Big fish. Hmmmmmm. I think someone in my family wants a boat or a sea kayak. I have decided that I need to just go and stop waiting around for the right equipment to magically appear in our driveway so that we can catch the big fish. I don't care about the BIG one. I just want my own fish to grill. I have committed to myself that I will pick up my reel, find a location close to my home and catch a big fish or a small fish with or without my family by my side. I want Isabella to have memories of fishing as I do from my childhood. If we wait around for the right "everything" and the right "time" then I know from experience it won't happen and time will pass us by. If it was impossible to catch fish from the shore, piers and bridges, then all of the people I see out fishing would not be fishing or would they. LOL Maybe it isn't about fishing but about something more. Like time spent together, being outside or having a few minutes to think while watching the sailboats drift by. Maybe fishing isn't about the fish at all. Is this how fish tales are made? With a desire and a wish for something grand only to be disappointed with a little teeny tiny fish. I guess I will find out soon. I will discover for myself if fishing is about catching fish or something else. I have grilled whole fish before and I always get a little bit frustrated because the fish tends to stick to the grate and flake apart. I had a reader suggest that I should lay the fish on a bed of sliced lemons. The man is a genius! It worked and I was able to flip the fish and grill it on both sides without loosing a lot of meat. I suggest you give it a try too. I added slits to the top side of the fish and slipped a few lemon slices into each slice. 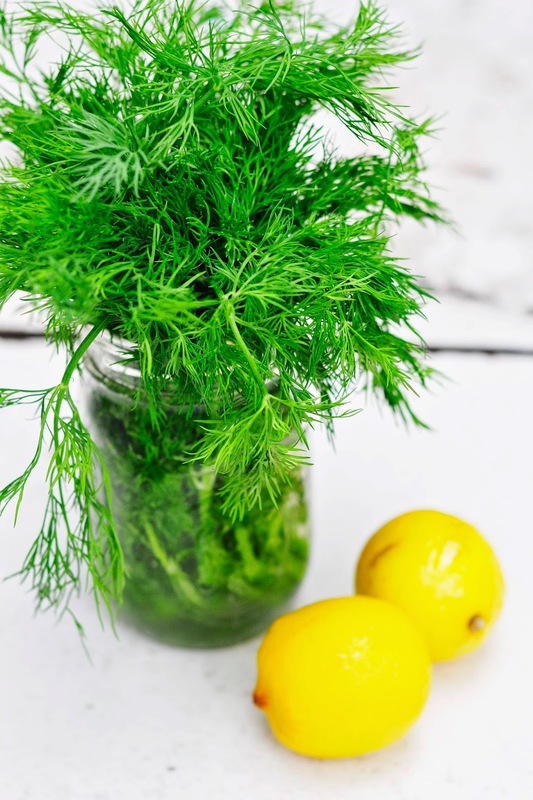 This helped when I flipped the fish to cook on the other side because I was able to grill the fish and still have them sitting on a bed of lemons. You can see from the picture below that I did not loose too much meat. 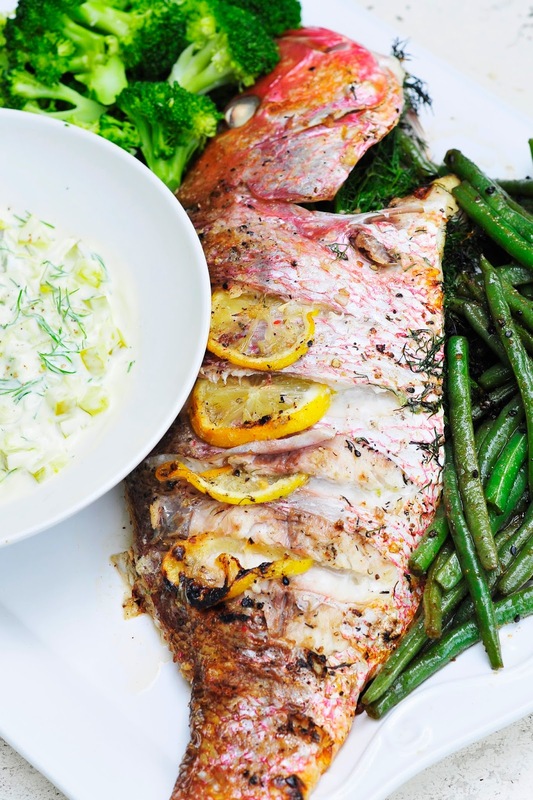 Grilled fish is a simple dinner to make. We usually serve it with rice and a bunch of steamed vegetables. If I have leftovers they reheat easy enough the next day. 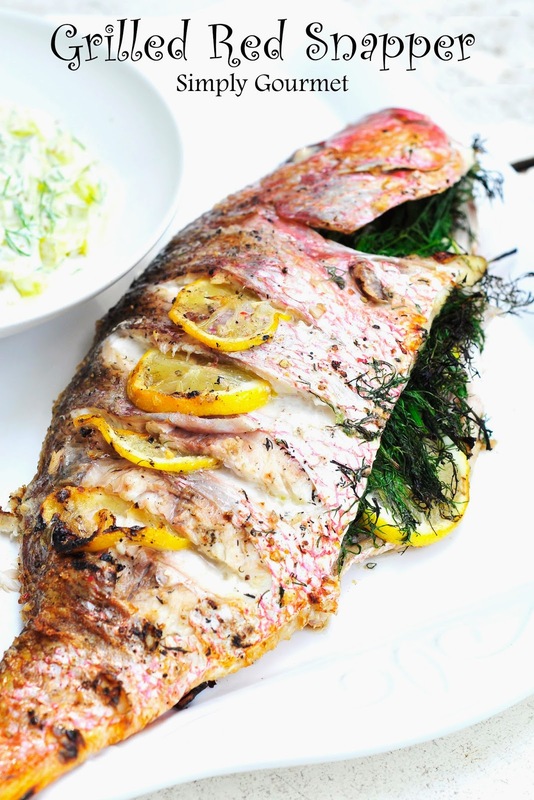 Whole fish can be baked in the oven, steamed in parchment paper , baked in cast iron, baked in foil or grilled outside on a gas or electric grill. 1. 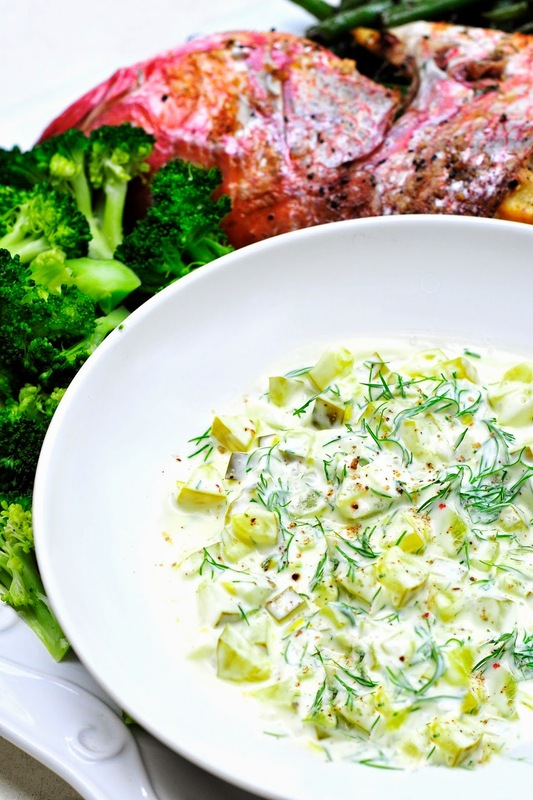 Bring outside grill to a temperature of 350 degrees or your inside oven. 2. Stuff the uncooked fish with dill and green onions. Slice a few slits across the top and gently insert lemon slices into each slit. Brush the fish with the olive oil on both sides. Sprinkle the fish with an array of seasonings on both sides. Squeeze half a lemon over the uncooked fish. 3. Slice two lemons in to 1/4 inch slices and place them together on the grill. Create a bed for the fish to sit on. Place the fish with lemon slices in slits UP. Cook for 7-8 minutes. It may take a few extra minutes because your fish is sitting up off the grill for the meat to cook through on one side. 4. Gently flip the fish using two spatulas. Trying to do this is one flip. Let fish continue to cook until firm to the touch. Total cook time should be about 15 minutes. Of course, this depends on the size of fish you have and your grill. 5. Remove fish from grill and serve whole or remove meat to a smaller plate and serve. I love red snapper, but I've never cooked a whole fish before, it's always scared me a little bit. 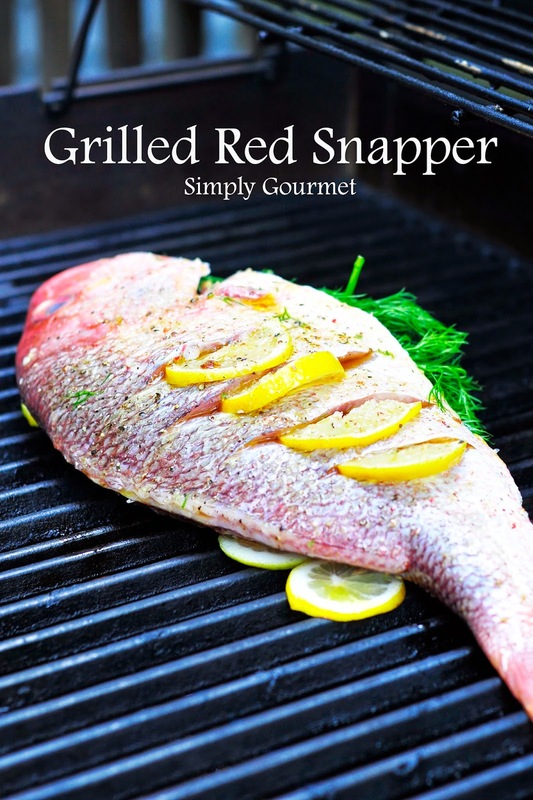 But this snapper looks so delicious and the presentation is gorgeous! A whole fish may be in my future! What about the bones? Are they easy to avoid while eating the fish?